1943 had been a year of Turning Points in World War 2, but 75 years ago few people could have known for certain the monumental events that would unfold in 1944. In this It Happened Here episode we take stock and look at the year ahead. The Big Three, Churchill, Roosevelt and Stalin met together for the first time and took decisions that would ultimately lead to the 6th of June, D-Day. In the wider war the Germans had bogged the Allies down on the Italian Front, while at sea Bletchley Park saw success with their contribution in the sinking of the Scharnhorst. Meanwhile back in the Buckinghamshire countryside, GPO Engineer Tommy Flowers delivered Colossus 1 to Bletchley Park. 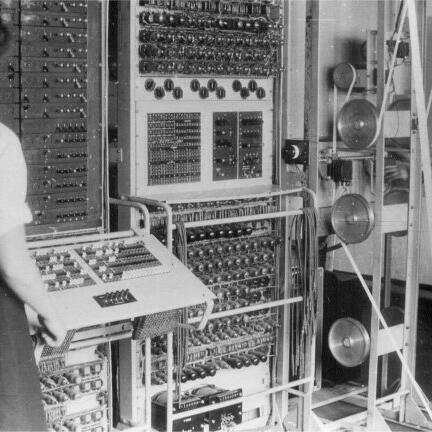 Seen now as the world's first large scale electronic digital computer, at the time it was part of the evolution of machinery that the codebreakers had at their disposal. As always, Bletchley Park’s Research Historian, Dr David Kenyon is our guide.